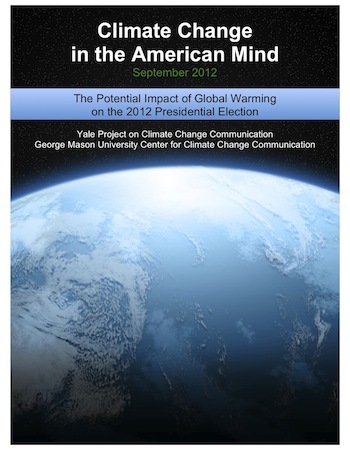 A national survey from the Yale Project on Climate Change Communication and the George Mason University Center for Climate Change Communication examines the beliefs, attitudes, and policy preferences of likely voters across a range of climate change and energy-related issues. The survey reveals bipartisan support for renewable energy and indicates that global warming is an important issue for "Undecideds" and likely Obama voters. The findings also suggest that "Americans across the political spectrum are receptive to new information on the topic – so long as communication efforts are effectively targeted and communicated in ways appropriate to the audience." Most undecided likely voters believe that global warming is happening (similar to likely Obama voters). Likely Romney voters are less sure that global warming is happening. A majority of Undecideds say that if global warming is happening, it is mostly human caused (same as likely Obama voters). Likely Romney voters tend to believe natural changes are to blame. There continues to be confusion about scientific agreement among voters. A majority of likely Obama voters say that there is scientific consensus, whereas a majority of likely Romney voters believe there is a lot of disagreement among scientists. Undecideds fall in the middle and are split on the issue. Majorities of both likely Obama voters and Undecideds say global warming will be one of several important issues determining their vote for President (less so for likely Romney voters). Undecided voters and likely Obama voters say that President Obama and Congress should be "doing more" about global warming. Fewer than half of likely Romney voters think the President or Congress should be doing more and many say they should be doing less. Should the U.S. use more or less fossil fuels vs. renewable energy in the future? There is broad bipartisan agreement that the U.S. should use more renewable energy sources in the future. However, Undecideds and likely Obama voters are more interested in decreasing fossil fuel use than likely Romney voters. About four out of ten Undecideds and likely Romney voters say they could “easily change their mind” about global warming. Over half of likely voters, particularly Undecideds, say they need more information about global warming.